Click, whirr, wait... Tah-Dah! You have arrived at the vinceunlimited Computers page. This page is dedicated to all the data about all the computers, laptops, tablets, mobile devices, hardware, software and associated accessories that I have owned or commented upon, where you can find out all about my floppies, bits and ram. 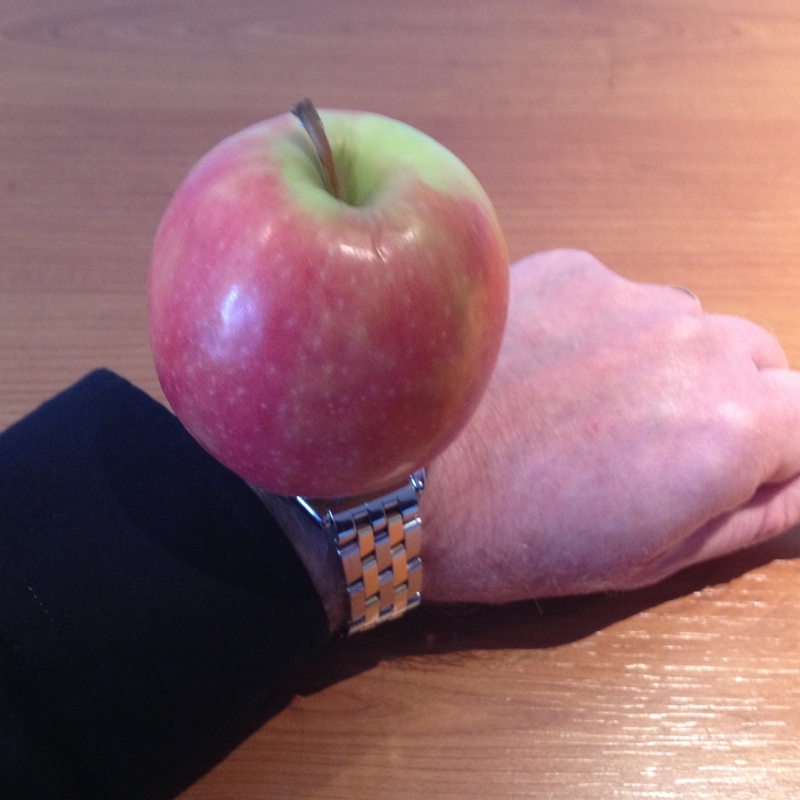 As the Apple WWDC draws closer the fervent ramblings of all tech commentators are reaching a near hysterical shriek about a supposedly new Apple iWatch. Even Apple's competitors are getting in on the act with rumours about watches from other phone and tablet manufacturers such as Samsung, Microsoft and Google. However no one is looking beyond this point. So obviously I must. I think the easing of device suppliers into a traditional watch industry will trigger a backlash from the real watch makers who might just think the crossover could work both ways and some interesting concepts may follow. For instance, Breitling has adorned the wrists of many a wannabe pilot so it would make sense for them to branch into tablets that perpetually showed dedicated flight sim apps. The detailing would be fantastic but there may be too many buttons on the side of the chronograph model for an Apple purist. Rolex may wade in with an ultra high quality phone, costing about fifteen thousand pounds. Think Vertue but with added bling. Unfortunately the thick gold case would be far too heavy to hold in one hand and there would be about £30 of glittery stain left on the pavement every time it was dropped. Timex would opt to sell a device for about £3.50 and it would have so many functions it would confuse an Android App enthusiast with a degree in Multi-tasking. And finally, TAG Heuer will think about building a phone fit for F1 drivers. This would be all carbon fibre and feature all sorts of seemingly unnecessary edges. And if you think I'm just jesting try searching for Tag Heuer racer smartphone in your favourite browser. The two subjects that most interest me at the moment are cars and computers and they do so for much the same reason. Both technologies are full of shiny new things promising thrilling, interactive experiences barely limited by previous experience. And integration of the two is becoming closer. Or more specifically, the computery stuff is getting more and more wedged in the cars, as I've yet to see anyone promising actual reality travel on a mobile phone chassis. The self-park, auto-cruise, blind-spot, iPod-connected, SatNav world of our auto-world is coming along nicely. However whilst a new phone, laptop or operating system is muted a few months ahead of release new cars take much longer to develop, possibly years. The cost of getting a chassis wrong is much greater than accidentally releasing a heavy, spiky edged laptop in purple that fails to attract an audience. If your latest hatchback is a dog the whole breed can suffer and we do not forgive easily [do we poor Lancia?]. But cars are increasingly having to differentiate themselves by their included technology, perhaps because they find it so difficult to distinguish themselves in the homogenous world of exterior automotive design. As an example, my car, a year 2000 Jaguar, could be an all time classic because the dials and gauges on display look like they developed glacially from a WWII Spitfire but the simple green-LED trip computer, inbuilt text only SatNav and multi-CD changer date it, by sheer coincidence, to around the year 2000. No Bluetoothing, WiFi enabled MP3s here. Electro-technology develops at a vastly different speed than mechanical stuff. So my first thought was why not combine the two. It's happening a little bit with iPod connections in almost every new car, allowing a feed of your latest downloaded beats into the built in car speakers. But this cable connector dangles the device on the seat next to you so when the new MapApp is opened it's hardly conducive to safe viewing. As I've said, some now incorporate all that SatNavery, iPoddery and SeatAdjustery into their colourful, dash mounted, fingerprinty, widescreen displays but in a decade or less won't they seem just a little bit, say, 2012ish. The answer lies in an updatable colourful, dash mounted, fingerprinty, widescreen display that can move with the times. And the computer world is conveniently supplying these already. Initially the iPad seemed the answer. A popular and current, ever customisable device that has secured a solid foothold in the market. But few cars could afford the dash space for a plug-in behemoth the size of a small plate of kippers. Then Apple released the Mini. All the adaptability of a full sized tablet almost designed to fit in a reasonable dash opening. If you were currently launching your latest Sports Utility GTi 4 x 4 convertible Sportwagon hatch wouldn't it make sense to let Apple or even others such as Samsung do the flatscreen bit for you so you can concentrate on the important things like finding ever more inventive ways to incorporate cup-holders? Your new dash-tablet could be programmed to interact with your car in ever more cunning ways, such as service/sensor monitoring, lap timing and cheap fuel finding. And there are a host of third parties that will do the awkward development bit of this for you. Just charge a fee for your API integration. Simples. OK you will have to allow some small flexibility over choice of device that will fit in, in case your Audi owner went for Android, your Mercedes customer wanted a Mac or your Westfield's chap wanted a Windows device if they choose to. OK silly point, no one who buys a car with the intention of wearing a flat cap will want a screen that does more than show the oil pressure warning lamp. Just one caveat. When I specified my Jaguar I could have been at the forefront of this technology/car interfacing. But right now my car would be fitted with a great big plug-in Motorola StarTAC flip-phone. And who wants one of those today? A recent but enthusiastic convert to the Macintosh stable I am now using my ninth Apple product [excluding accessories] and each has been truly Golden Delicious. Initially, like many, I was sceptical about plunging headlong into the orchard but chance brought me into the core and I have now nibbled away since 2007 on many wondrous devices. 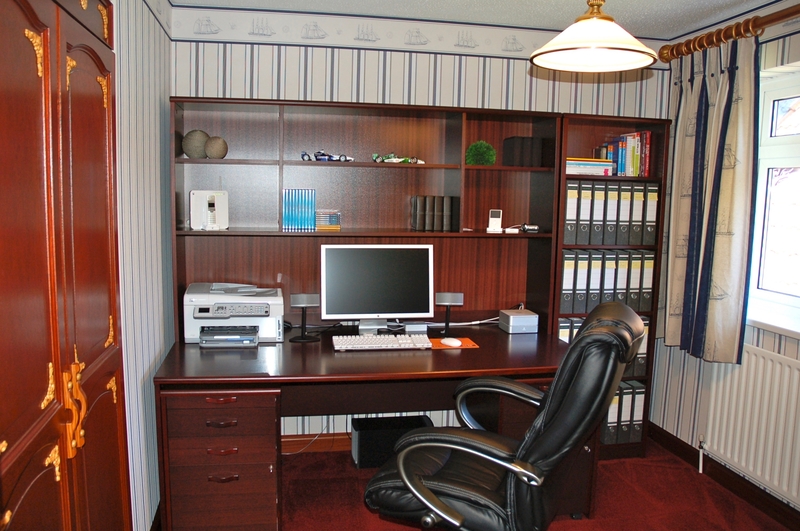 It all started when I was redoing my office, as shown in the photograph. A bedroom was converted to accommodate my electronic needs and desires both personally and officially and the centrepiece was to be a good looking computer. Previous PC setups had included various CPUs and screens and experience had taught me that the CPU and displays became obsolete at differing times. This reinforced the notion that PC separates were the way to go. So a search was on to find a compact CPU and great looking screen. The screen was the stumbling block. All were dull, black and uninteresting but then I saw the light. It came shining in when Apple opened my local Apple Store and nestling within was this magnificent looking 23” widescreen Cinema Display. It clearly had my name on it so I grabbed copies of all the Mac publications I was able to carry and became convinced I could become one of the enlightened. I wasn’t quite brave enough to go for the full all-in-one iMac and to be honest wasn’t keen on the over-square design at the time. 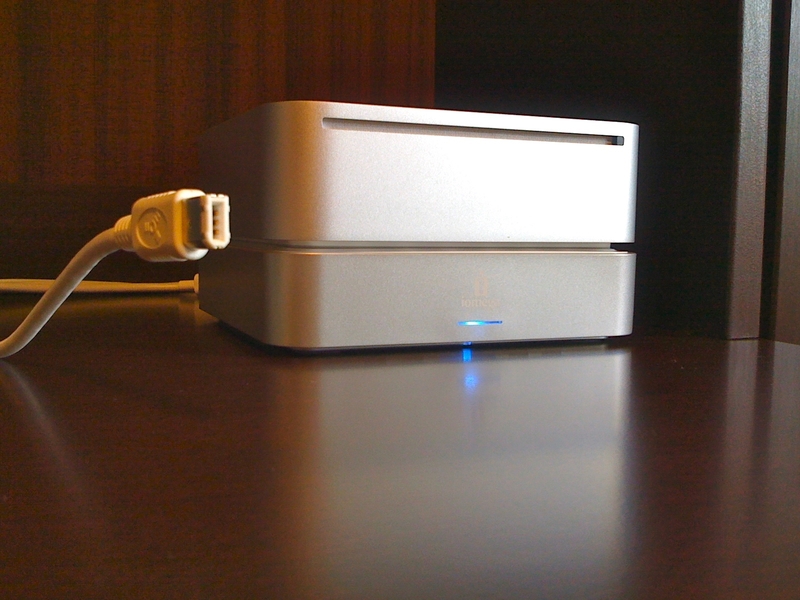 I considered a Mac Pro but chose a Mac Mini as a ‘starter’ kit, just in case I was actually a PC. And that’s not mentioning the phenomenally successful iPhone with sales so high there is no more space off the chart. I’ve played my part and had three iterations of these. Being such a new found fan of Apple products I have been musing a way of describing how a Mac computer differs from a industry-standard PC and I think the answer lies in a car washing analogy. The PC - This is the jet wash - It takes an awful lot of effort and skill is needed to get a satisfactory result. It is best if you can get constant assistance from someone who knows what they are doing. Unfortunately it will cause damage unless care is taken all the time. The Mac - This is the car wash - It is simple to use but more expensive. It does all the work for you using simple logical commands. It is only likely to cause damage if the basics like putting your aerial down are ignored. You come away thinking that the car wash has actually been the clever one, as opposed to yourself. The Linux - The bucket and sponge option. Far too much effort and I'm not that poor any more. 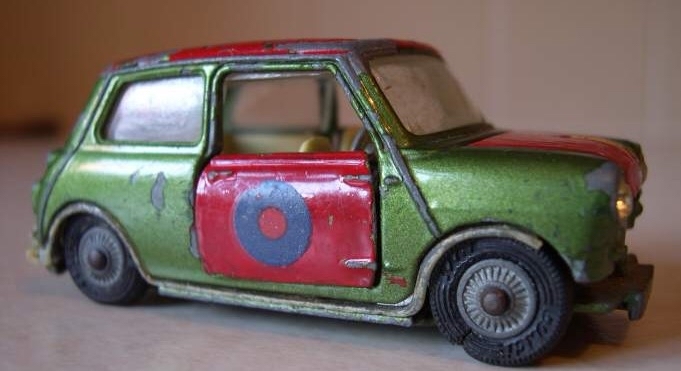 Like all Austin, BMW and Mac people I am rather fond of my little Mini. It’s cute dimensions, uncluttered look, surprisingly good for its size performance and its ‘actually runs a full Macintosh OS’ qualifications compel you to love it. I chose the Intel Core 2 Duo driven 2.0GHz stock model with 2Gb 667MHz DDR2 SDRAM and a 160Gb hard disk. 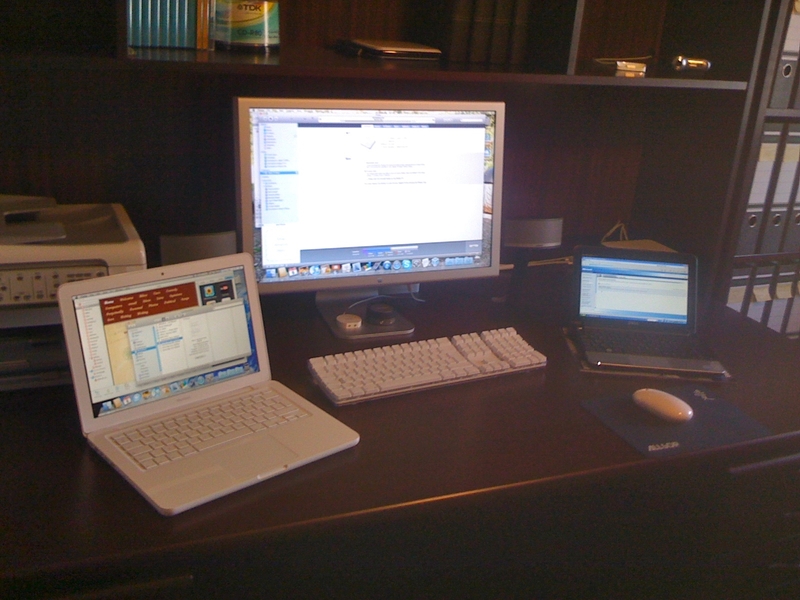 Disappointingly it shipped with the new Leopard software as I am rather fond of Tigers but it also sported the full Mac iLife 08 Suite which I bolstered with an 08 version of iWork to reinforce the official view that it was a real business purchase. Being bereft of all accessories I coupled it to the 23” Apple Cinema Display that initiated the purchase and allowed me to see what was going on and a wireless keyboard and mouse to actually do some going on. Backup is as important to a Mac-Man as it is to a lowly PCer so I accompanied my Mini with a matching Iomega MiniMax MMHD, a 500GB USB/Firewire 400 back-up drive. The inbuilt Time Machine software does all the difficult bits of coordination between the two. Transgressing from the dark side of PC usering to become an Apple Fan-Boy is not all plain sailing. For instance the Mini does not have a built in camera and Apple had discontinued it’s sideline in accessory visionary devices by dumping the popular iSight Camera. However I had a smart looking Logitech QuickCam Fusion which had temporarily sat atop my crusty old laptop and once allowed me to Skype my friend in Australia. Unfortunately the model was shown as incompatible with fruit based CPUs so I had to butcher a way round this, which actually proved to be pretty easy using a software application called Macam, even if the fancy zoom and lets pretend I’m a dinosaur effects won’t work. I have also become accustomed to upgrading to the latest software as it comes out. This is a Mac user trait and thankfully Apple, unlike Microsoft, do not feel the need to totally fleece their customers each time this happens. Not that it is all cheap. No Apple products are. Quality comes at a cost and you don’t enter the world without generous pockatage. However, the process all feels more silk than fleece. In time I decided that I wanted a speedier, faster Mac. My original Mini had proved I could be an Apple user but the speed limitations hindered use of some of the more powerful software, particularly the inbuilt music creator, Garageband. I chose the simple option of buying a replacement model from the new 2009 range Apple conveniently launched for me and traded up to a Intel Core 2 Duo driven 2.26GHz stock model with 4Gb 1067MHz DDR3 SDRAM and a 320Gb hard disk. With twice the RAM, twice the disk and 1.599700149925037 times the speed I am now a well content Leporidae. But the road to change wasn’t as smooth as the sales pitch might think. Apple make migration from one machine to another a pretty simple step. It’s all handled pretty automatically, like most Apple stuff, using easy to use software. All I had to do was connect old and new, press a couple of buttons and hey presto, a new Mac looking somewhat disappointedly exactly the same as the old one. What the instructions failed to foresee though was each machine had to be attached to something to allow said buttons to be pressed. I only invested in a new Mini [CPU] and therefore only had the one keyboard. My misses clears extraneous clutter like a supercharged Wall-E and all spare keyboards had been long been filed away in the big grey receptacle. However, Apple was at hand and my new cutsey box lost it’s virginity to the Time-Machine backup from the MiniMax. Having an Intel engine allows me to run [spit] Windows on my Mac and my preferred method of doing this is via Sun’s VirtualBox and XP. This allows me to emulate the wondrous old habits of virus protection, Windows security updates and Internet Explorer whenever I get the need. For a long time I waited impatiently for Apple to release their much anticipated iPad tablet. I figured that such a device was the answer to pitter pattering away whilst watching TV. However in frustration of their delay and with need to get on with this website before Alzheimers set in I decided to get a MacBook instead. Purchased in December 2009 it is a factory-standard unibody white unit boasting an Intel 2.26GHz Core 2 Duo and has 2GB of 1067MHz DDR3 RAM, close to its 250GB drive, whilst glistening through a 13” glossy screen. If you are reading this it clearly works. 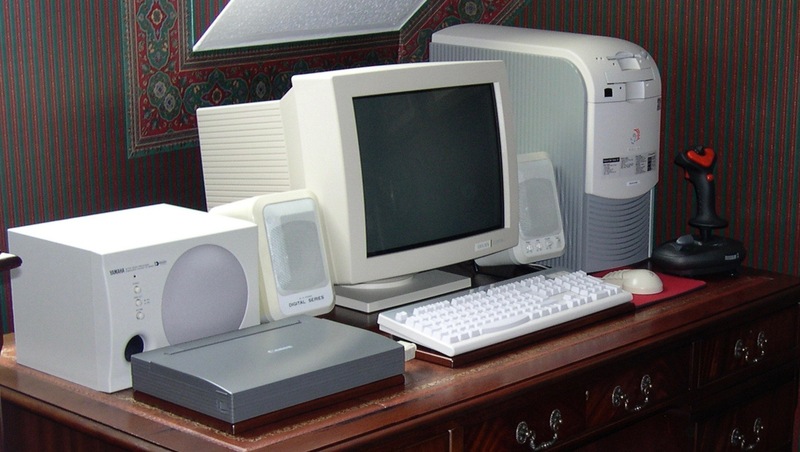 Many PC based computers have passed before my hands but only a few remain, partly because of the needs of friends and family, partly because of the calling of eBay but mostly because, as discussed above, the misses doesn’t like keeping clutter. Not that any of these outdated machines were rare enough to be worthwhile now, even the very first ex-work behemoth running CP/M on a green-black screen. These were the days of command lines, 5.25” floppies and frustration. My first real PC was a metal cased, custom built desktop of dubious heritage containing both 5.25” and [new] 3.5” floppy drives. This was superseded by a much more powerful [in the sense that a beetle is more powerful than an ant] Packard Bell tower case which along with the CRT monitor, keyboard, mouse, printer and Yamaha speakers filled my desk space completely. In between times I discovered the joy of laptop computing and my first foray into this was in 1999 when I invested in a Dell Inspiron 15” primarily for work use. This was superseded by the Novatech [see below], which I still own. I also recently purchased a Dell Mini Netbook, primarily to ensure I had a reliable Windows based machine because some stupid outlets still insist on good old XP [also, see below, but this time a bit further down]. My now outdated Windows based laptop is a Novatech Soprano. It is very heavy for a portable, more of a movable unit boasting super fast 3.07GHz HT Intel Pentium 4 running on 512Mb RAM. Although now slow compared to the multi-core processor machines. Storage is a [not nearly as gigantic as it used to feel] 60Gb hard drive and the world is accessed via the built in 56k modem. 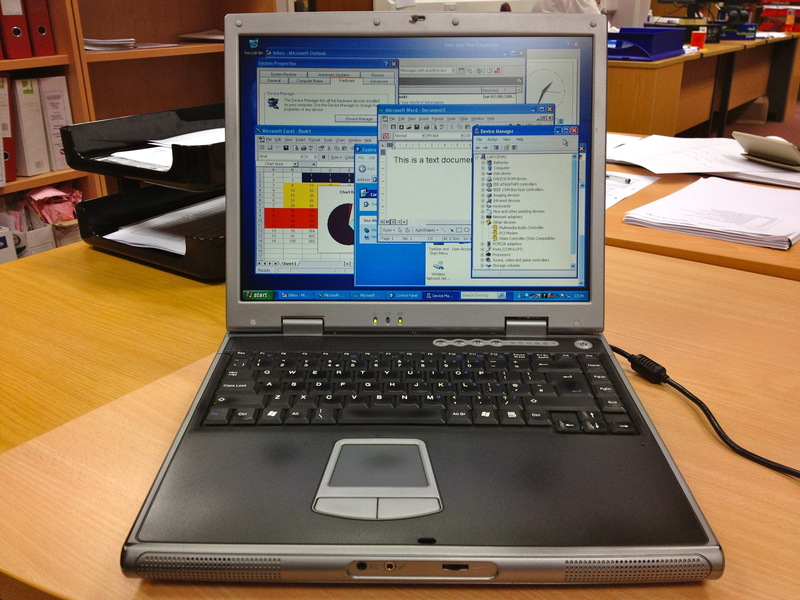 I run Micro-pathetic XP Professional and display on the built in 64Mb 15" TFT LCD. Audio is supplied by two small shrill insects inside somewhere that like to go bleep very loudly at times. You can see a photo of this by looking at my article about my system in 2003. 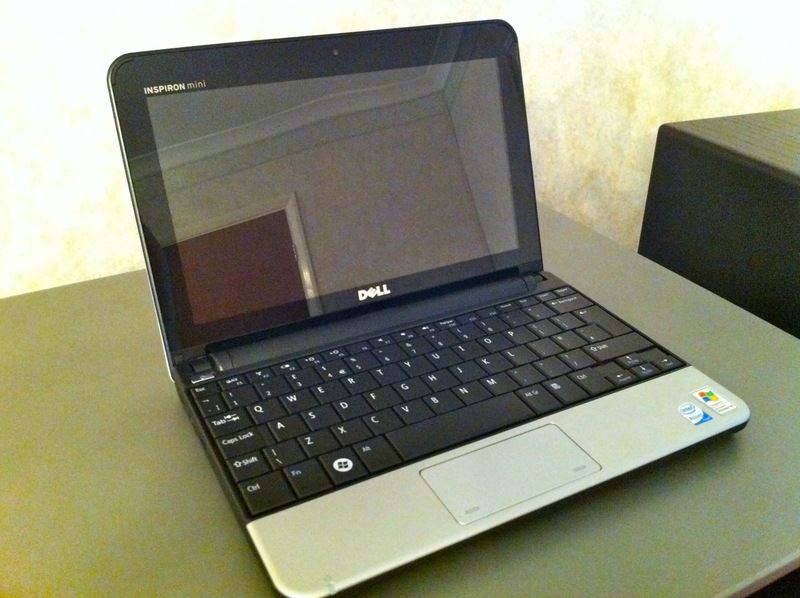 The Dell Mini 10 was, as alluded to earlier, purchased as an insurance against the failure of the Novatech. In particular I have a computer based HiFi processor which insists on getting its updates via an XP interface. The quality of the processor is such that it warranted such an acquisition but the Mini is a useful tool for quick and dirty Internet Explorer [spit] web-use such as insisted by certain work clients [after the obligatory updates and virus protection refreshing]. The Mini 10 sports, if that is not over-egging the cake, an Intel Atom Z530 1.6GHz motor driving a 1Gb RAM with 160Gb HD on tap. A Hewlett [I will take over your system if it’s the last thing I do] Puckhard HP Photosmart C6180 All-in-One, which is a basic lie as there are absolutely loads of things it doesn’t do. It does do however boast WiFi operation, full colour printing based on the usual sell your mortgage ink supplies, photocopying, after a fuss and only via the website remote scanning and hope it works facsimile functions. It was chosen as it was the least looking like, but still quite like a, bread bin model. BT provide my WiFi needs via a snazzy HomeHub 2. This dust collecting device spits out up to N grade WiFi and acts as a router as well. It could cope with up to 8Mb but BT tell me that my home is only worth 6Mb. Which would be OK if the speed tests showed more than the usual 3000 to 4000 kbits/s down and about 250-300 kbits/s up. Willy Gates supremacy has been usurped by Steve Jobs so now he has my vote as far as usable programmes go. The operating system I mostly use when I have the choice is now Apple’s Macintosh in the latest feline variant. Work still requires that I use good old MS applications which have as much attraction to me as another MS does and the start up times are still a pain. Big M still does well on Excel but the now mighty Gates user base is gradually being eroded by the superior Fruit named alternative. No, not a home for arachnids but details of this site. The software which I used and which design house I employed [Do you really think this is professionally made?]. Here are details of the software used to create and uplift this webpage to the great World Wide Web and onto your screen. This is the third generation layout of my first effort at designing and producing a website and I have finally surrendered to time and used a web-creation package, namely Apple’s iWeb. O.K. I can’t boast of programming in HTML any more but content is King so at least now that it’s out I can make pretty updates quicker. I now use the inbuilt web creation FTP supplied with iWeb and if I feel the need to go all manual I get in touch with my FileZilla side. I use BT as a broadband Internet Service Provider. And in return they give me a whopping 6mB of the 8mB they promise. I am also a signed up member of the MobileMe family so Grannie Smith also does a spot of hosting on my behalf. I use Web-Mania as a Web Server provider. The price is reasonable so naturally they let someone into my account once. Nerds. I would add it onto the Apple servers but would lose an element of personalisation. 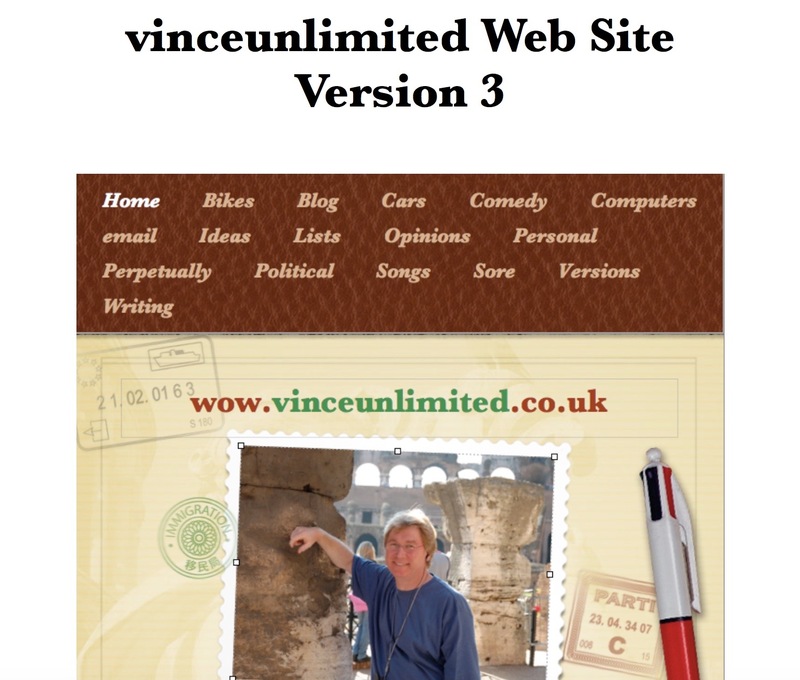 Website conceived, designed, produced, checked and sent to you by Vince. So that's me then. In truth desktop systems probably wouldn’t exist, being far too cumbersome so this system will actually all fit inside a clock on your mantlepiece. Except mantlepieces will be considered so passe that the clock will have to sit on the floor. Here the clock will gather far too much dust so will be moved back onto a desk. Hence, the replacement desktop system. A Brooklyn [yes, as in Beckham] 2030, carbon fibre micro case with AMD [touchy] ZZR series 38.9THz triple-quad-bus bio-platform, running through 56k DOS, on 93Gb TAM [total access memory] and 22,222Mb standard video RAM boosted with a 4D-VR 39Gb acceleration card giving graphics from a 16377 x 9212 DLP4 screen utilising 32 million and one colours. They found another one - Hurrah!. Storage is a bio-neural vector imaging carbofile with immeasurable capacity pseudo-hard drive utilising aluminium organospheres but still no room for those ultra HD3D video files. Outside access is via a 4649M video-modem through we-will-actually-pay-YOU-fifty-Eurodollars-serve.com. Still uploading at about 33k usually. Software is Air-con [which is proving much better than Windows] whilst audio is supplied through a multi-phase version 6.947.34a amp with graphics displayed on a widescreen 73" plasma projector SCD with Dolbyson Pro-logisense sensurround implant flat mini-speakers with three separate built-in giga-woofers. Boooooooooooooooooooooooom!. RolexPro Diamonte with Apple-chip processor and superlite mini-screen, glued to inside of contact lens with thought activated inputs. Solar powered, with 11-month backup battery, developed by the Norwegians, unsurprisingly. Having finally run out of every single combination of words starting with i Jonny Ives has finally allowed Steve Jobs to use the j moniker. However the now Lord Ives had his design workshop reconfigured so perfectly that he cannot find the door handle and hasn’t been seen for years. As a result the now US President Jobs had to head up the design for the jMac and it looks like a pair of old jeans with a black turtleneck top for a screen. Shares in Apple have fallen and may drop as low as $50m dollars each. Resorted to using my original Canon Bubble-jet, although I have now changed the ink cartridge. Yesterday Apple finally launched their much anticipated iPad and I have been lapping up every Tweet, blog and story about the thing. One reason for the interest, other than my confirmed fanboy status, is that for months I seriously considered that such a product may well be the answer to my personal electronic needs. However, I recently saw sense and avoided waiting for a 1.0 version of an untried, theoretical device, with no known cost and purchased instead a MacBook. I think my decision may be correct. The iPad is gorgeous, but not available for six months, still uncertain in UK price and may not actually do all I want it to do. No-one has mentioned working with iWeb yet, my primary reason for a hand held device. However, as Tweeted today, I think there is a market for this that is as yet untapped. The elderly. Or rather the non-tech, reasonably wealthy elderly who have yet to get a computer or on line. I'm thinking my in-laws here. This product is designed for my father-in-law. The standalone design meaning no awkward telephone connections. The user friendly intuitive GUI meaning no keyboard/mouse learning. The inbuilt simple bookstore. The scalable text for failing eyesight. I'm convinced. He has admired my iPhone for some time and I am going to recommend this iPad to him. Today I am working from home. No, really, I’m at home and working. I’m not just messing about on my computer. It’s real work. I know it’s work because I have to open an Excel spreadsheet. As usual, it is a complex, multi-formatted workbook with SUBTOTAL functions and my Mac’s pretty little spreadsheet, Numbers, does not seem to support these professional tools. As a result I have had to install Sun's VirtualBox which will allow me to load in my copy of Windows XP and the MS Office package on to my Mac. I really do not want to do this, other than for the fascination, as it will be like fitting a Kia sunroof with ill fitting lock into my Jaguar. The process involves adding Sun’s VirtualBox, Microsoft’s XP, the XP SP2 disc, MS Office 97 Suite [I can’t afford the extortionately priced upgrade, alright], adding AVG virus protection, then running several dozen Windows Updates, each of which wants to have its very own restart. I will then be able to fire up the Excel sheet. All of which is very time consuming and will mean I won’t be finishing early today. I'm in the long process of converting one of my bedrooms into a home office and central to this new environment will be a shiny new PC. I have been looking for a machine that hits the right aesthetic notes as well as performing magnificently. My major problem area was finding a decent screen and I stumbled into a corker in the new Apple Store that someone kindly set up in my nearest town. This got me thinking all Mac and I've decided that I would suit a quirky set up. Now, whilst I await latest product news, I am getting all keen and buying up all the Mac magazines and trawling the website constantly. As a result I'm very familiar with the Mac adverts [both US and UK versions]. Naturally, being me, I immediately turned my attention to thinking up a new ad. As with all the other ads it opens with the familiar 'PC' and 'Mac' characters. PC: "Hello, I'm PC and I'm very popular, though I sometimes don't get on with everyone." Mac: "Hi, I'm Mac and although not as commonplace as you PC, I get on with anyone. Straight out of the box. This makes me smugly better." PC: "But, who is this Mac? I can't seem to make it out. You're so cleverly compatible Mac, tell me who it is." Mac: "No. Sorry. At a loss there for once." [To third party] "Who are you?" Third party: "Hello, I'm Amstrad emailer." Welcome to the hard page, part of the computer section within vinceunlimited. Information provided for the purposes of cyberjerks and thieves. Packard Bell Pulsar 23 tower case (taking up too much room on my desk) with Intel Pentium MMX233Mhz (slow now) running on 64Mb RAM (32Mb SDRAM plus 32Mb SIMM upgrade) and 2Mb standard video RAM boosted with an Orchid Righteous 3DII 12Mb ATI Rage II+ 3d acceleration card. Storage is a (used to be gigantic - but not any more) 4.3Gb hard drive (no room for those video files) and outside access is via a 56k modem through Freeserve (connecting at about 33k usually). I still run Microsoft Windows 95 (not 98, 98SE, 2000, ME or XP I hear you enquire) and display on my 17" Taxan monitor (cost £500 new, now standard fare) with audio supplied through dual speakers and a Yamaha sub-woofer (booooom). A custom Novatech Soprano laptop (heavy for a portable, more of a movable) with super fast 3.07GHz Intel Pentium 4 running on 512Mb RAM. Storage is a (gigantic - for now) 60Gb hard drive and the world is accessed via the built in 56k modem through Freeserve (25-44k, why the difference?). 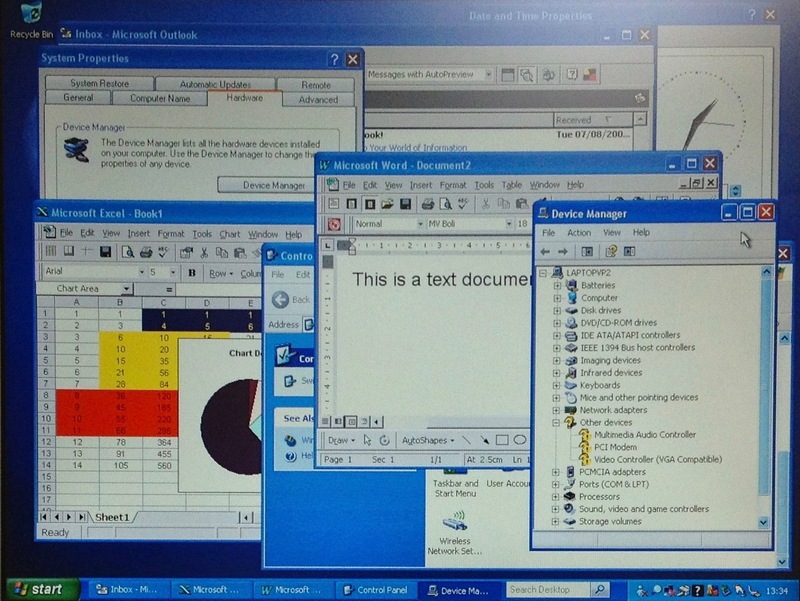 I run Microsoft XP Professional and display on the built-in 64Mb 15" TFT LCD. Audio is supplied by two small shrill insects inside somewhere that like to go bleep very loudly at times. Canon Bubblejet (say no more). Adam Sanz emailed me to ask if I still had the Packard Bell or anything remaining from it. Unfortunately Adam didn't leave a working email to respond to so I have replied here. The answer is no. I am not a collector of outdated tech or anything else and tend to sell my equipment on or pass it to someone in my family, when superseded by new stuff, usually whilst it still has value. In the case of the Packard Bell it was given to a family member. Welcome to the soft page, not that this page is softer than any of the others - flexiscreens haven't yet hit the streets - unless you know better. As with the 'hard' page this is designed for all the nerds to discover what I like to use to ease me through the exciting world of computing, software wise. Willy Gates has my vote as far as usable programmes go. His pricing policy is questionable, as is the constant redevelopment of ideas. I have no problem with him making trillions as his products have revolutionised the way we work together but he could be fairer to legitimate users. And the policy of constantly re-inventing basic necessities (Yes, I'm talking Windows here) seems a touch greedy. No wonder so many turn to piracy. Why do the class leading products, with their international markets, sold in hundreds of thousands of units sell for the highest prices? Ship 'em out cheaper Billy Boy and we'll all buy legitimately in their millions and so make you even richer. I know you could do with the extra cash. The operating systems I use is good old Microsoft Windows 95 on my home desktop and XP on my work laptop. This conveniently hides the OS in the background and I rarely venture into white on black screens these days. The 450mB ramquirement and 10 minutes to start up are a pain. The big M (no, not McDonalds) also does well on applications. I learnt spreadsheets on Lotus 123 and early on supported this application along with the other excellent programmes they produced, particularly Organiser. The Lotus look is generally superior to Microtosh but the mighty Gates stronghold is more and more eclipsing the user base. In all I don't think this will be a problem as compatibility is paramount in the new technology of computing. Make it work, make it compatible - backwards and forwards and make it cheap. That's all we ask for. And improve email programmes too. I've not yet used one that isn't total pants. As for Apple Macintosh? What's the point? I thought their skins were waterproof. On a more serious note though, congratulations must go to Apple for pushing the boundaries of technology design. Now what about PC software. When will we see true user friendliness in GUI's guys? 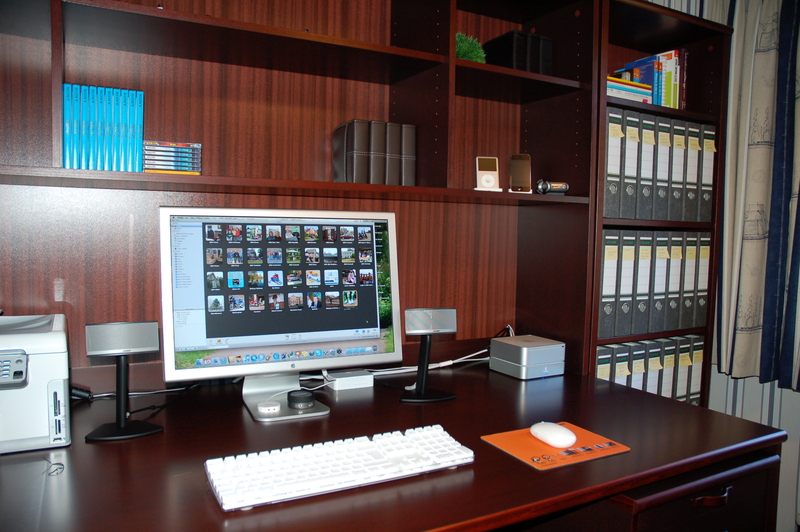 And I don't necessarily mean a virtual office layout with a point and click 'photo facsimile' of an office desk. That's the real world. We're in an exciting new electronic medium here. Let's use new technology to work in a new world. Lose the Qwerty keyboard and references to files. This is electronic media. Voice inputs, multi-dimensional applications, 3D visuals and neural partition storage is the way to go. If you guys don't come up with the quantum leap then I warn you, I will. Finally, why do games recreate what we do in life? I agree with top class simulation programmes but let's stretch the imagination and create wonderful new multi-dimensional worlds of true beauty - aurally and visually. Let's not go mad on nasal simulation though. I fear this strand of technology may be abused! 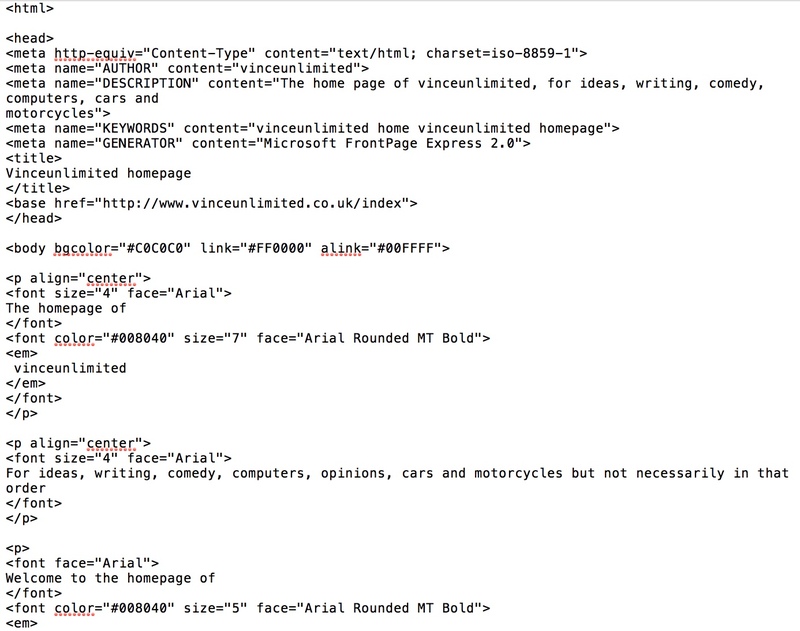 You have reached the web page of vinceunlimited. The details of the software used to create and uplift this webpage to the great World Wide Web and onto your screen. As this is my first effort at designing and producing a web site I decided to keep it simple using a widely available programme which would produce a product that was readable on the majority of the world's computers, using minimum facilities. From the outset I decided that content was far more important than fancy graphics and fonts although I hope to improve the general look and content in future releases and when more users have faster internet access. A standard look is vital in creating visual consistency and will aid the reader in remembering the site. And it saves me having to constantly invent styles. If you like what you see, or can imagine what I could achieve with better facilities and want me to help you design your site - contact me. My services are available. Originally I used a standard version of Microsoft FrontPage Express, version 2.0. Although from version 1.03 the code was hand written in HTML (ask your son) using Microsoft Notepad. No other software was used. Does it show? I use Smart FTP. Because it can be loaded free for private users. And I'm not loaded. I use Freeserve as an Internet Service Provider. Free. So give them a big hand. I use Web-Mania as an Web Server provider. The price is reasonable so they come well recommended. Website conceived, designed, produced, checked and sent to you, by Vince. So that's me then. Welcome to the future. Check out my computer specification of the future. My guess [in October 2003] for year 148AV [anno. vincy]. AOF-serve Brooklyn 2020, carbon fibre micro case with AMD [touchy] ZZR series 38.9THz quadbus bio-platform, still running through 56k Dos, on 93Gb TAM [total access memory] and 222Mb standard video RAM boosted with a 4D-VR 12Gb acceleration card giving graphics from a 6789 x 2212 screen utilising 32 million and one colours. They found another one! Hurrah! Storage is a bio-neural vector imaging carbofile store with immeasurable capacity pseudo-hard drive utilising aluminium organospheres. Unfortunately, still no room for those video files. Outside access is via a 4649M video-modem through we-will-actually-pay-YOU-fifty-eurodollars-serve.com Still connecting at about 33k usually. Software is Aircon, which is much better than Windows. Audio is supplied through multi-phase ver. 6.947.34a displayed on a widescreen 73" plasma projector SCD with Dolbyson Pro-logisense sensurround implant mini-speakers with built in giga-woofer Boooooooooooooooooooooooom!. RolexPro Diamonte with Applechip processor and superlite mini-screen, glued to inside of contact lens. Thought activated inputs. Solar powered, with 11-month backup battery, developed by the Norwegians, unsurprisingly. Still got my Canon Bubblejet, although I have now changed the ink cartridge.